Rondoletia amoena is a very attractive plant, and really easy to grow. 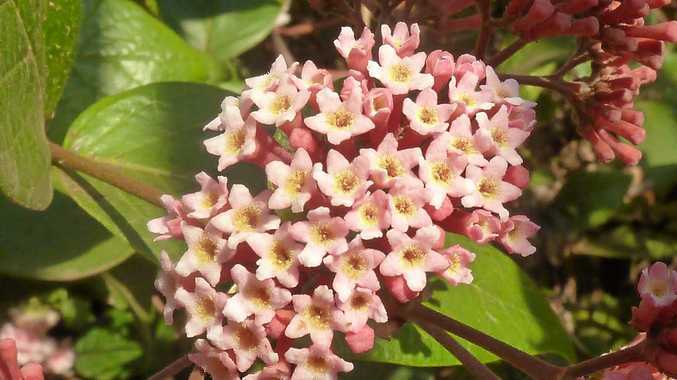 Rondeletia amoena is a hardy, evergreen shrub that grows to about 3m. It's one of those old-fashioned shrubs that have fallen out of favour for no apparent reason. It's very attractive, and really easy to grow. You might see it flowering now, especially in old, established gardens. The leathery leaves are olive green and slightly felted beneath. They can be up to 12cm long, oval-shaped with pointed ends, and have quite prominent veins. Rondeletias flower from mid-winter through spring and into summer, bearing many large clusters of small yellow-throated salmon pink flowers at the end of the branches. The blooms are very pretty and mildly fragrant. They are plentiful, which means that you can easily steal some to use as cut flowers without destroying the effect. They have nice long stems and last a week or more in a vase. As well as being a good background plant, rondeletias make a lovely screen or hedge, because they are quite dense in habit, especially with a light prune after flowering. But this plant is pretty enough to use as a feature in a garden. If you trim off the lower branches as it grows, you can even use it as a small tree. One of the reasons for its popularity in years gone by is its adaptability and resilience. It will grow in full sun or part shade, sand or clay, acid or mildly alkaline soil. It will tolerate wind and some coastal exposure and even light frost. It won't mind if you don't get around to pruning; it will continue to do its thing year after year regardless. Pests and diseases seem to ignore the humble rondeletia, especially if you can water occasionally in dry times and fertilise every now and then.